I’m a big fan of pesto. Fragrant, flavourful, and so versatile, pesto is a culinary lifesaver. Years ago, I used to make my own pesto but nowadays I just don’t have fresh basil lying around and truthfully, I’m the only one in the family that appreciates it. It’s a great lunch saver especially if I have some leftover pasta lying around. Add a spoon of pesto, a bit of parmesan, throw in a few veggies, and I’m good to go. It’s so much better than picking up takeout! I’ve tried to find a store bought pesto sauce that works for me but it hasn’t been easy. I’m not a big fan of the pre-made pesto sauces with almonds or pine nuts because I can’t be sure it’ll stay fresh long enough for me to use it all before it all goes funky in my fridge. After all, I’m the only one that’ll use it and while I love pesto, I’m not eating every day. It’s taken me a while but I finally found this PC Pesto sauce made without pine nuts or almonds. 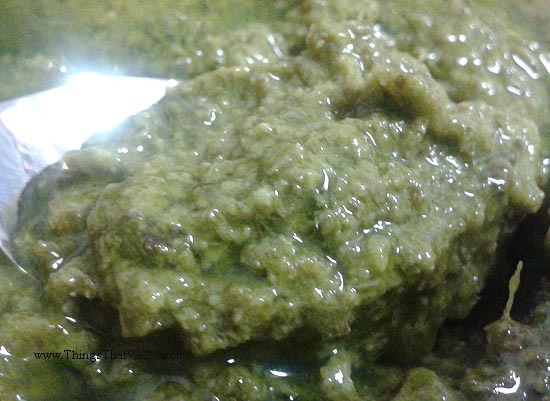 So, what ingredients are in this PC Pesto? 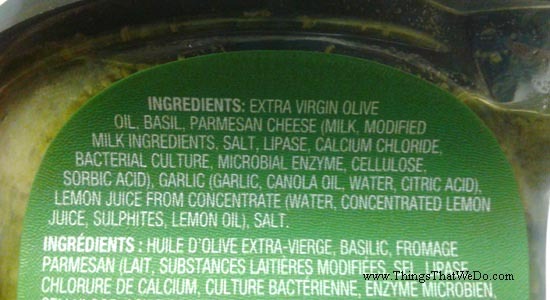 Here are the ingredients that went into the PC Pesto: extra virgin olive oil, basil, parmesan cheese (milk, modified milk ingredients, salt, lipase, calcium chloride, bacterial culture, microbial enzyme, cellulose, sorbic acid), garlic (garlic, canola oil, water, citric acid), lemon juice from concentrate (water, concentrated lemon juice, sulphites, lemon oil), salt. All things considered, this ingredient isn’t terrible. I mean, the first few ingredients are bang on: olive oil, basil, and parmesan cheese. I love that salt and sugar aren’t the first two ingredients and while I’m not a big fan of cellulose, it’s also not high on the ingredient list. 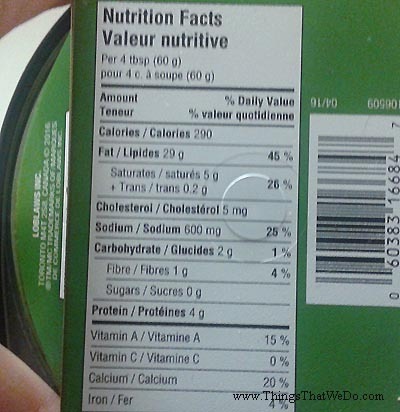 In the ideal world, there would be even fewer simpler ingredients on this list but hey, I get it, it’s a processed packaged item for my convenience and for me at least, this is tolerable. Taste test: is this PC Pesto any good though? Me? I like this PC Pesto sauce but I can see that it might not be for everyone. I like that it’s basic and gives me the freedom to throw my own ground almonds into the mix if I wanted to. Others may detest it particularly because it doesn’t have any nuts. Is it as fresh as your own homemade pesto? Obviously not but it works as a pesto sauce with all the same flavours that I’d expect from a pesto sauce. The only thing I did to give it more oomph is add more lemon juice and an extra splash of parmesan. It worked well on my leftover pasta and I was quite happy with my lunch. 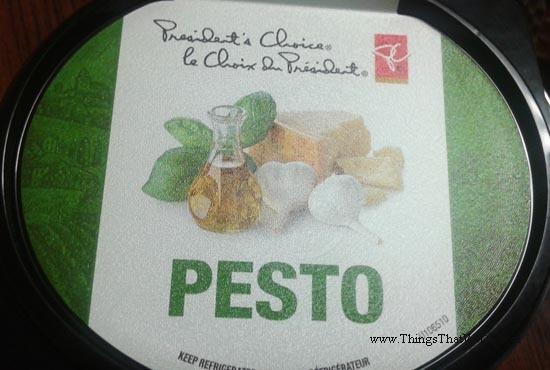 Verdict: would I buy the PC Pesto again? Actually, yes I would but it won’t be for a while. Given that I’m the only one in the family that likes pesto, I’m currently pesto’d out so I won’t be craving it any time soon. However, given that this is pesto sauce has the base I like for my pesto, I would pick it up again as a backup lunch saver. You see, I would have included a photo of the lunch I made but well, um, I forgot. Sorry! The PC Pesto is simple enough in flavour that I could embellish it with some sautéed mushrooms and onions (yum) or just a splash of parmesan. It also tastes great with some fresh tomatoes. Yep, that’s what I would do. For me, I appreciate that the PC Pesto doesn’t have the added almonds or pine nuts but it might not be for everyone. In case you’re interested in learning more about this product, visit their website by clicking here.